Note: I wrote this shortly after arriving at the Crusoe Island Lodge, Tuesday November 5th, to capture my thoughts…so keep that in mind with anything you saw on Facebook or Twitter since then. I look forward to another post on the island soon as well! 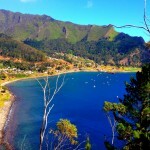 My adventures on Robinson Crusoe Island started before I even got there. 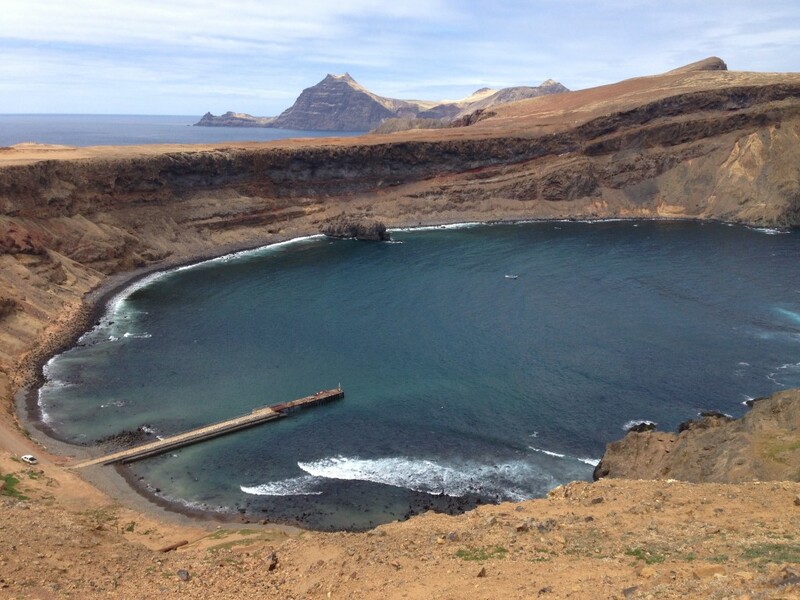 Just getting to Robinson Crusoe Island in the Juan Fernandez Archipelago is a task in and of itself for several reasons. None of which have to do with searching for buried treasure! The long ordeal of getting to Robinson Crusoe Island starts back at the Santiago International Airport domestic check-in terminal at counter 104…the last counter in the airport. 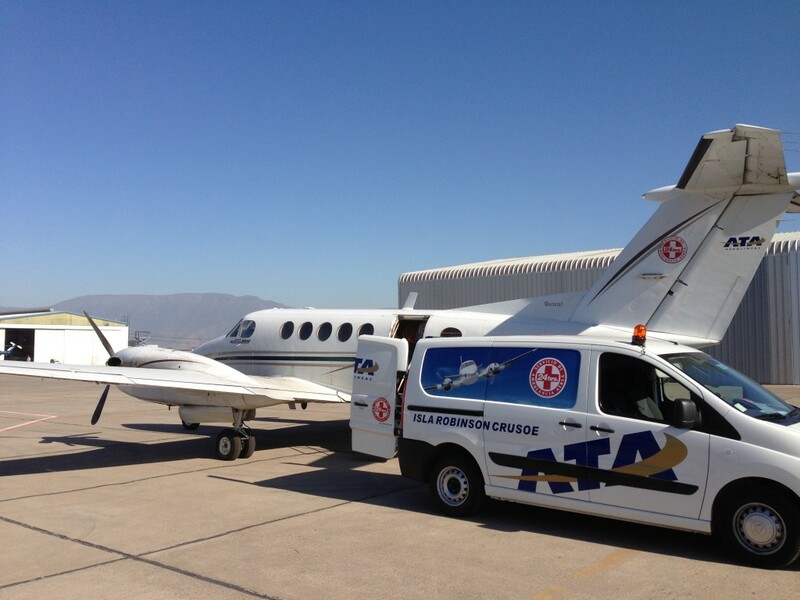 ATA Airlines is a very small Chilean domestic airline that operates to a few select destinations and along with Lassa is the only airline that flies into Robinson Crusoe Island-it flies in twice a week; Tuesday and Friday if all goes according to schedule. As you arrive at the airport and walk to counter 104, you will notice nobody is there to check you in. There is no gate agent, there is no television screen saying Robinson Crusoe Island, there isn’t even a sign that says ATA Airlines…anywhere in the airport! As my flight was supposed to be at 9:30am, someone with an orange vest finally showed up at 9:15am and asks us our names and to weigh our bags. He never asked for a ticket nor did he check our names against a list of passengers. There were only 7 passengers and I guess he figured if you were there to go to Robinson Crusoe Island, you probably legitimately had a ticket as so few people actually go there! From counter 104, we headed through security with all our bags and down a special staircase to the tarmac where a minivan picked us up and brought us to the plane. The plane was parked at a remote building as far from the terminal as humanly possible-seriously. As you can see, the plane is not a big one and I was expecting pretty much this but the plane was actually nicer than I was expecting. 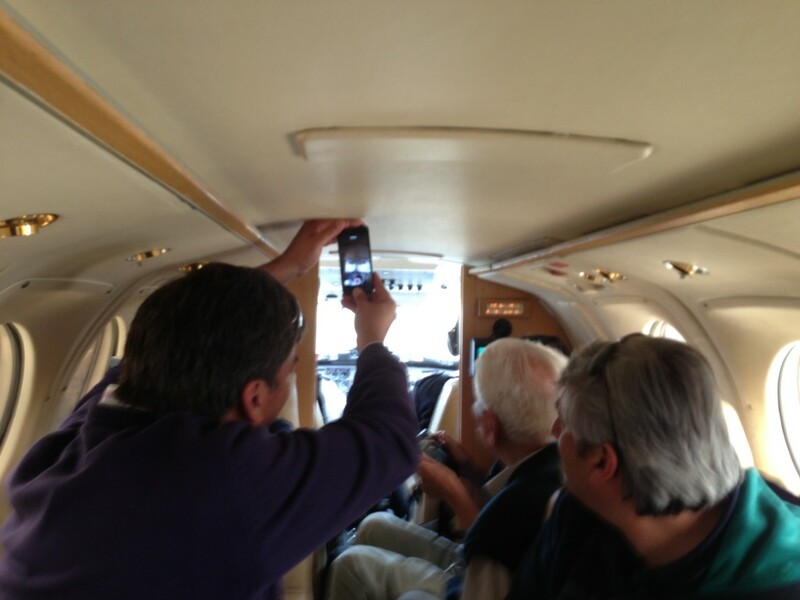 I have been on many small planes and many have been much scarier than this Beechcraft 200. The 7-seater was set up as the four in the back of the plane, where I was, face each other then between those seats and the pilot there is a bench for 2 passengers to sit next to each other looking sideways and one seat opposite the bench looking toward the back of the plane. Then there are two pilots; which was refreshing to see! The flight went off without a hitch and really didn’t get interesting until we were on our approach to land. 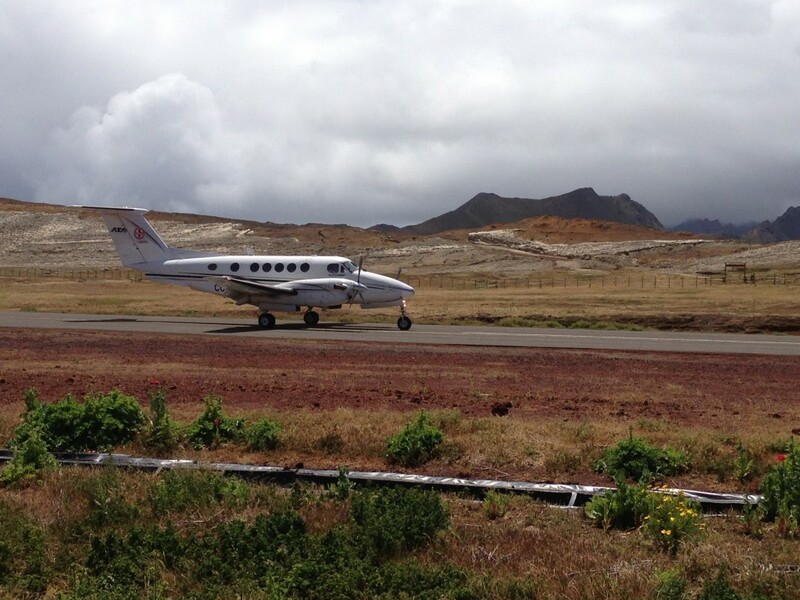 The airstrip is in a place on the end of the island that is very difficult to land. To say the landing was harrowing would be an understatement. The woman who was next to me was screaming on the final approach, as the angle you have to take is very steep and jerky with the cross winds! I personally didn’t think it was that bad. I’ve landed at some of the world’s most inaccessible or harrowing landing strips such as Madeira or Bhutan (albeit in 737’s or a similar aircraft). However, it was really windy and the cross winds did play tricks with the plane for sure. Obviously we landed safely and everyone was happy. 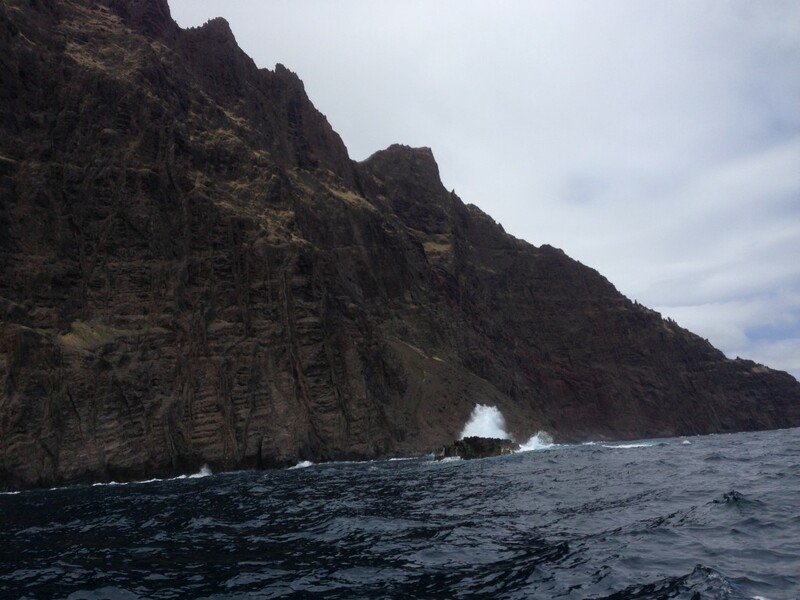 I was especially happy as getting to Robinson Crusoe Island meant I had reach my 309th Travelers Century Club (TCC) list country. But just landing on Robinson Crusoe was just the beginning of the journey to getting to the actual pueblo (town or settlement) on the other side of the island. 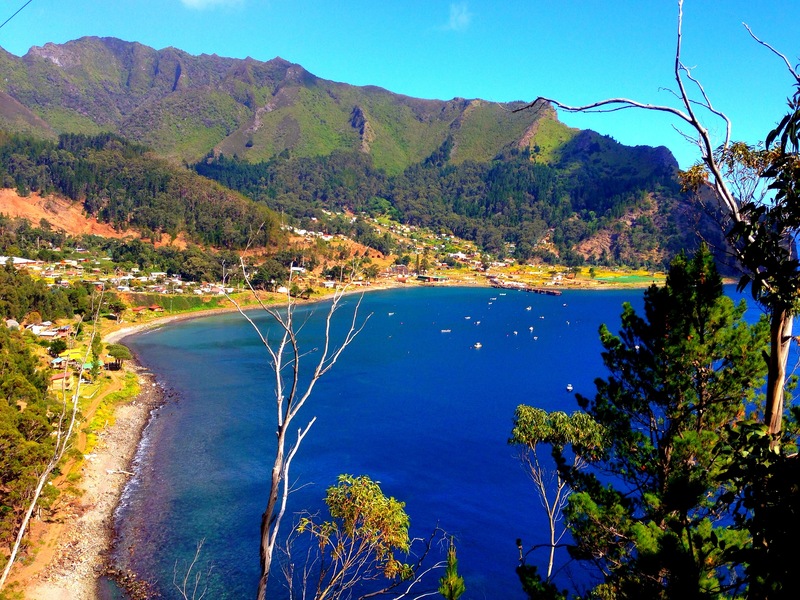 The landscape of Robinson Crusoe Island is what you’d expect with a name like Robinson Crusoe Island. It is rough, jagged and impassable for cars for a majority of the island. With the settlement being on the other side of the island and the total population of the entire archipelago being under 1000 people, we were forced to take a boat. I had heard something about taking a boat before I even thought of coming here but didn’t really give it a second thought. 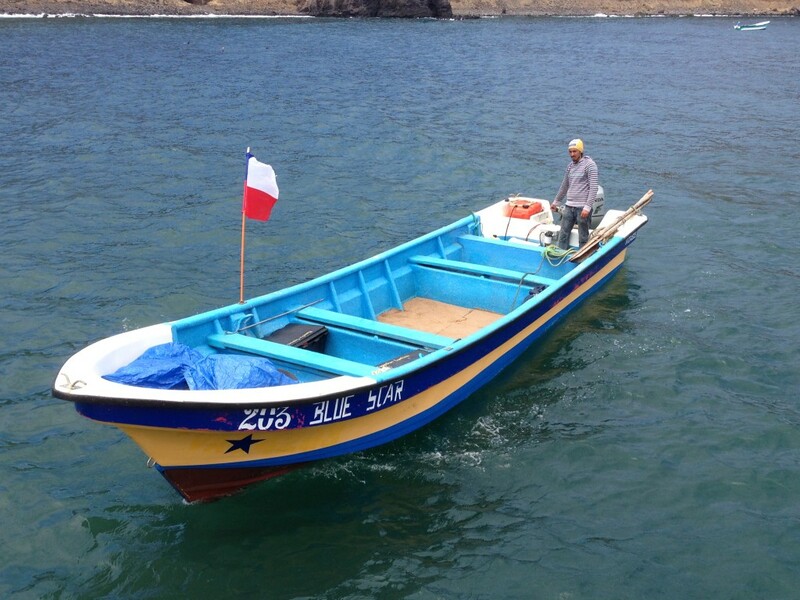 I just figured it’d be a small motor vessel to whisk us away. Again, I was ignorant, but first I had to get down to the port. There is only one jeep that goes from the airport; which is at a pretty high elevation to the port, a mile or two walk down a steep and windy dirt road. Being as though the bags and cargo took up most of the jeep and there was an old man and a woman on the flight with us, myself and a few other guys offered to walk down the road. 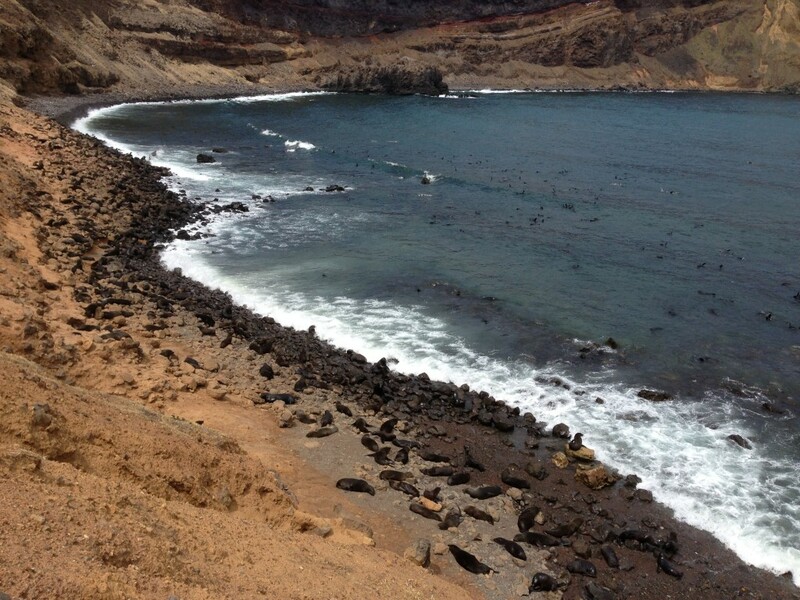 I didn’t mind or anything and it gave me a chance to get some great pictures of the scenery and seal colonies below. 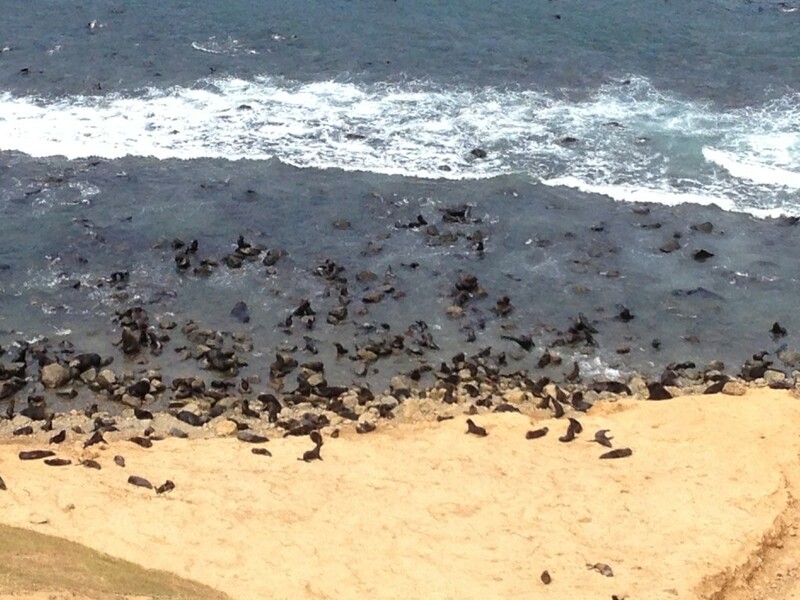 The black fur seals are in by the thousands and occupy the beautiful little cove. They were great to watch as we awaited the jeep; which took its time getting down. After the jeep arrival and the arrival of the passengers from pueblo who were leaving on the plane we just came in on, we loaded the dinghy up to head to the pueblo. 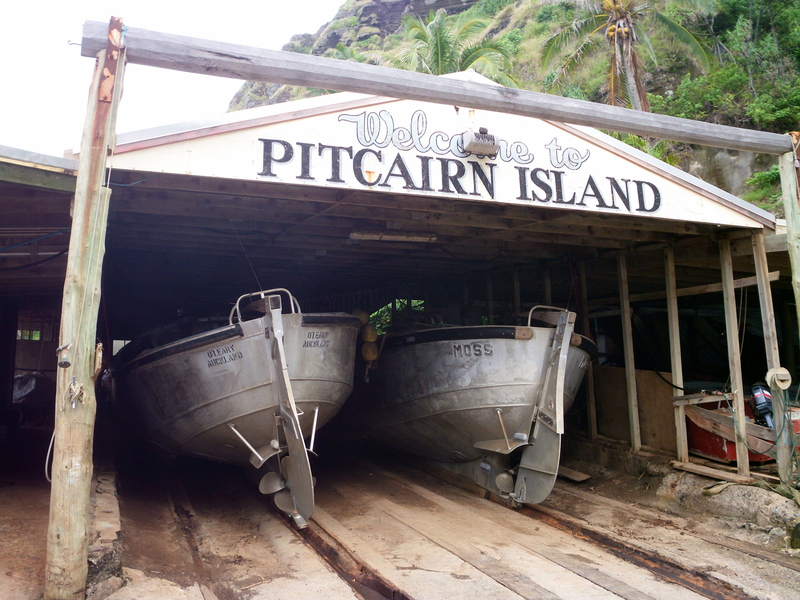 The dinghy reminded me of the boat that came to get us from the SV Xplore when we arrived at Pitcairn Island. But as we set out and the water got really rough it really reminded of that same landing at Bounty Bay where I got drenched and so did my bags. But these people were more proactive and actually gave up canopies to cover up and also put one over the bags. I still got drenched of course, well my face, hat and glasses with only minimal soaking of my shoes. Being as though I was pretty sick with a bad chest cold, I wasn’t thrilled but there wasn’t much I could do about it. What I didn’t realize was that the boat ride was going to take 2 hours. 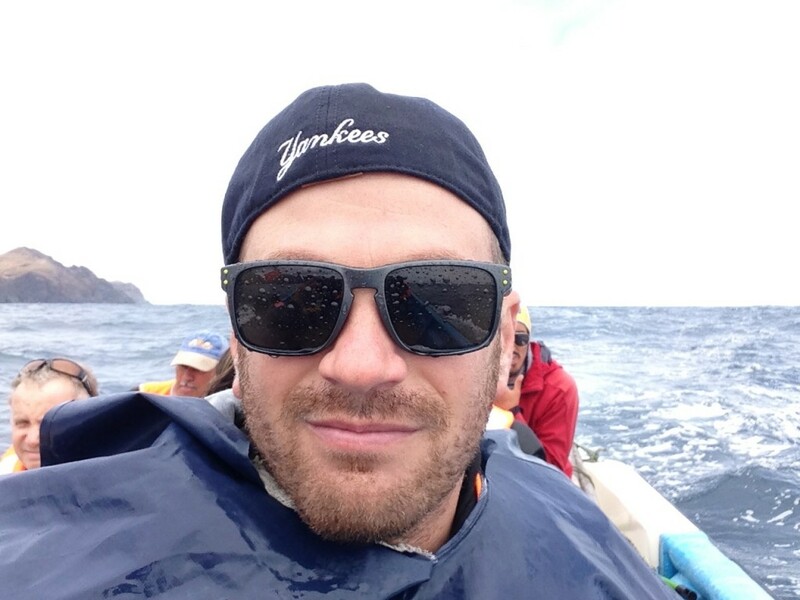 I don’t mind rough long boat rides as I’ve had a few in my days of travel and I’ve only got sick once on a horrible experience aboard a boat to Tokelau in the South Pacific. Some other passengers didn’t quite have the same stomach. The older man started vomiting off the edge of the boat as the rough waters made it pretty uncomfortable for him. I felt badly but again, what could you do. The weather was pretty cool, cloudy and somewhat unpleasant as we started. It got a little sunnier as we made our way so we were able to enjoy the seals and dolphins dancing around out boat. 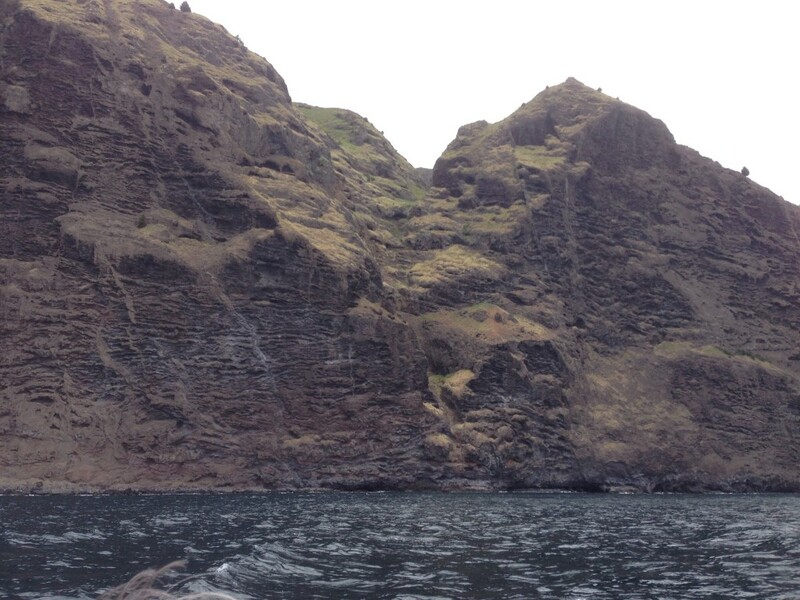 We also got to see the awesomely rugged layout of the island. I remember thinking myself; I can’t believe anyone lives here, how is it possible? But finally we came to a clearing and there was the settlement. Much of the settlement had been destroyed during a tsunami in 2010 that went largely unreported in the western world. I only knew about it because I had twice looked into visiting the island in the past few years but it never worked out schedule wise or logistically. On arrival, Francisco from the Crusoe Island Lodge met me. He had some fresh lobsters in the back of the truck that were apparently for me. The lodge is as far from town as it gets but it is also the nicest place to stay on the island by far. However, as I sit here now on my first day on island typing this with a great view, I am pretty relaxed. 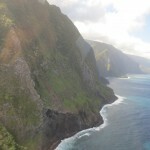 I’m looking forward to the next few days of trekking, snorkeling and whatever others adventures I can get into here on Robinson Crusoe Island. Meanwhile, I will also try to relax a little and get better as I have a big trip coming up soon to the South Pole and I want to be at my peak physically. 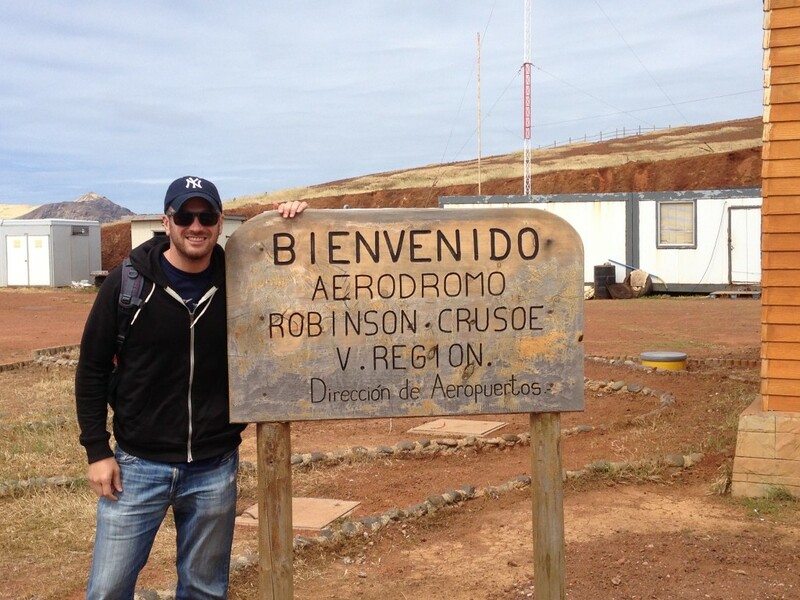 As for today, I’ve already had my adventure just getting to Robinson Crusoe Island. 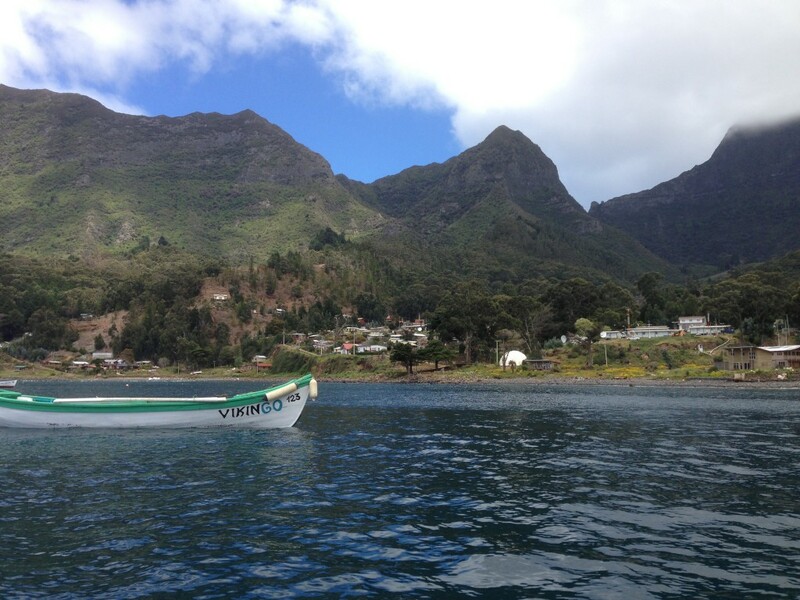 I mean, it’s called Robinson Crusoe Island-it should be an adventure right?! Now it’s time to go enjoy my nice lobster dinner! 2 hrs in that boat!! maybe I can do it with dramamine, ginger and motion sick bands hahaha… i glad you have fun!! 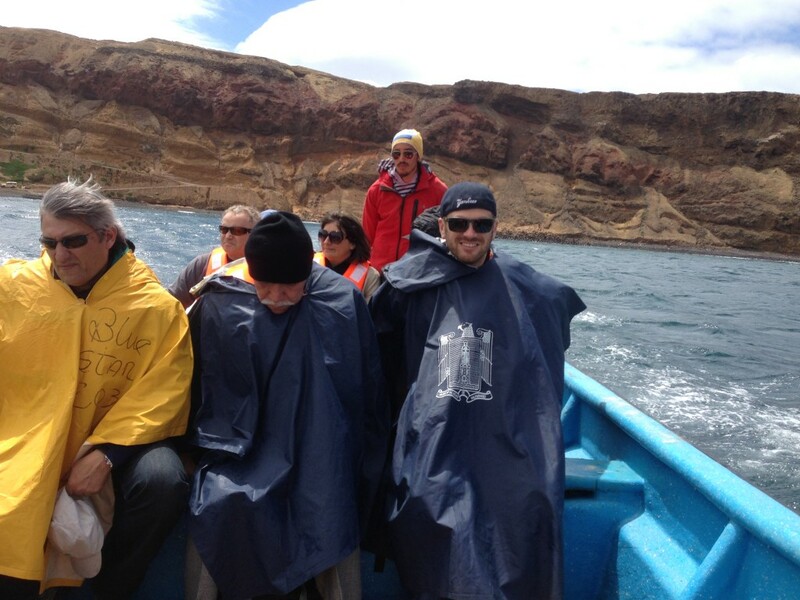 Haha, I had fun but 2 hours in that boat was not fun, especially being sick myself, freezing, wet and watching the old man puking! They really should get a covered boat…on the way back we got even more drenched so had to fly back with wet pants, shoes, socks etc…That aside, the island was great! 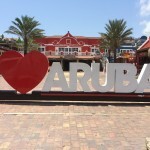 I loved reading about your trip, I have been wanting to move and retire there. How much would it cost me to get there and Iive in some sort of cottage, or hut? A rough estimate on how much cash I need if you don’t mind? Wow, that is some story…sounds miserable! I’d throw up too after 2 hours on that little boat in bad waters. 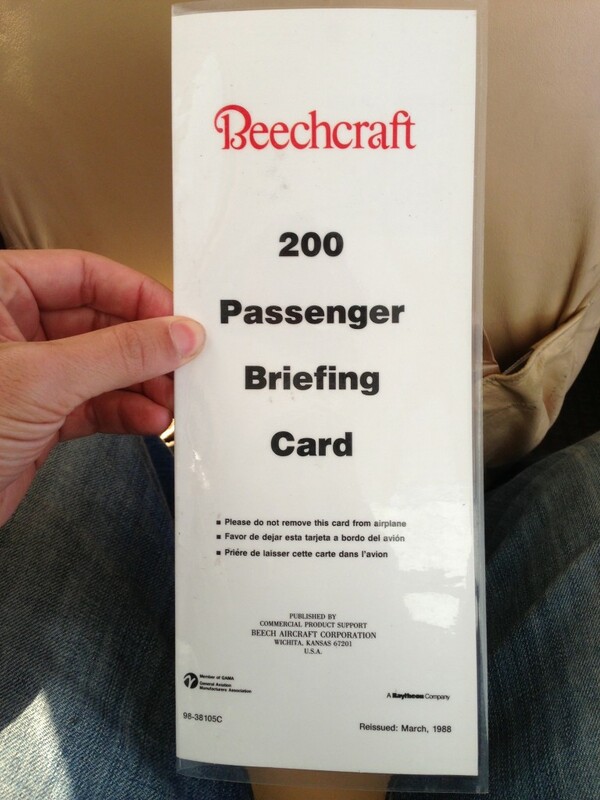 That passenger briefing card is from 1988! There’s no way I’d get on that plane! I didn’t even notice that but yes it is! 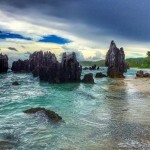 GREAT post, very vivid description and good photos to match! Sounds like an interesting place to visit. I had never heard of it so thanks for introducing me to it Lee. 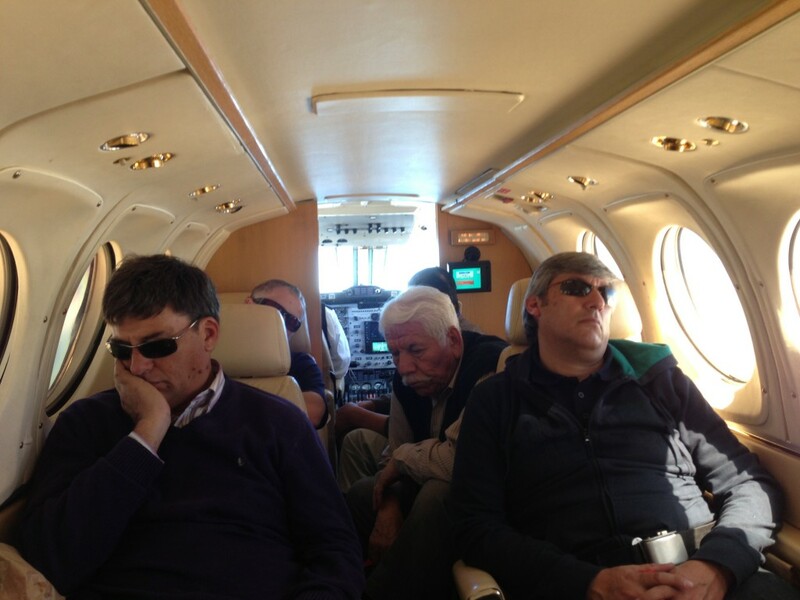 Those grumpy looking people in the plane. They don’t look like they have fun! How did you make the arrangements with the airline? They don’t seem to have a website. 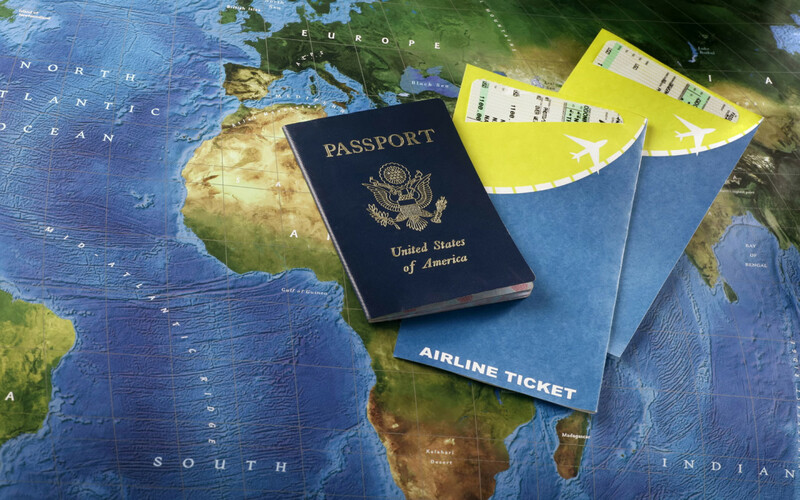 You have to arrange directly with the airline or use a third party agent…there are a few you can find online…you cannot book these tickets online and it is a pain to book them-this is a fact. Oh yeah, looks like a perfect trip to me, I like places that You cant expect everything going in 1-2-3 steps as usual, ….had to shutdown FB so will enjoy You travelings and experiences here 🙂 Good Luck with South Pole mate I hope You will be 100% tip-top until then . My wife and I are planning to visit this island next year. I’m just worried now about the 2 hour boat ride on that small open boat! I got sick last year on an hour long whale-watching boat trip and that boat was 4 times bigger than the one you rode on! Man, I’m pretty sure I’ll get sick again this time! I really thought it would just be a straight flight to R.C. Island from Santiago! I visited the island a few years ago. Actually, the plane that took us there used to depart from another part of Santiago, not from the main airport. As I read your story it took me back to the plane ride, the landing, the path that that took us down to the boat. 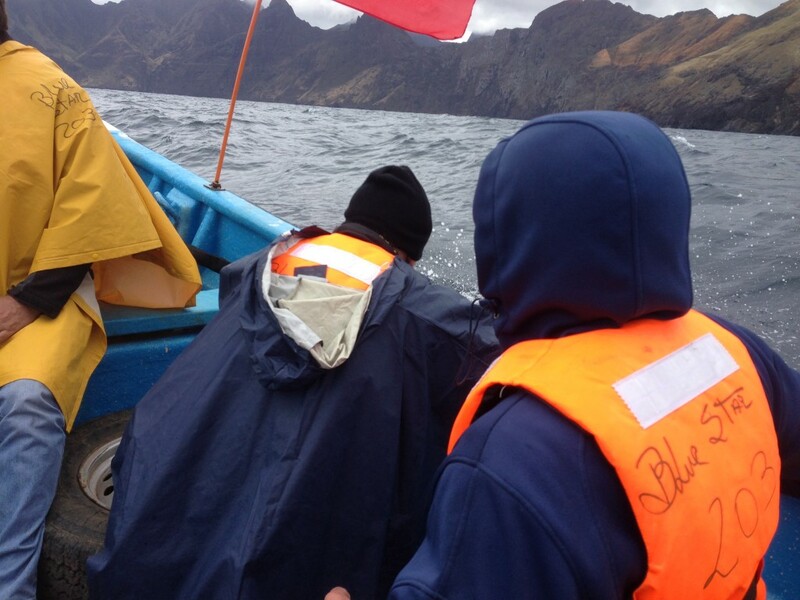 That day the ocean was quite rough, so it took a few attempts to get in the boat. Fortunately, we’ve got into a bigger boat so the ride was not so bad. I don’t remember the boat ride being that long though. 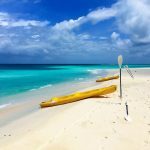 It’s so worth visiting this island that not many people think about it. We ate lobster and fish everyday! when we got back into the continent I just wanted a nice piece of chicken or steak. 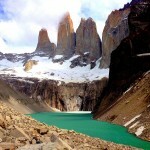 I want to recommend this island to my friends that are visiting Chile soon. They are thinking about Eastern Island instead. I have visited Eastern Island as well !!!! Thanks Lee. 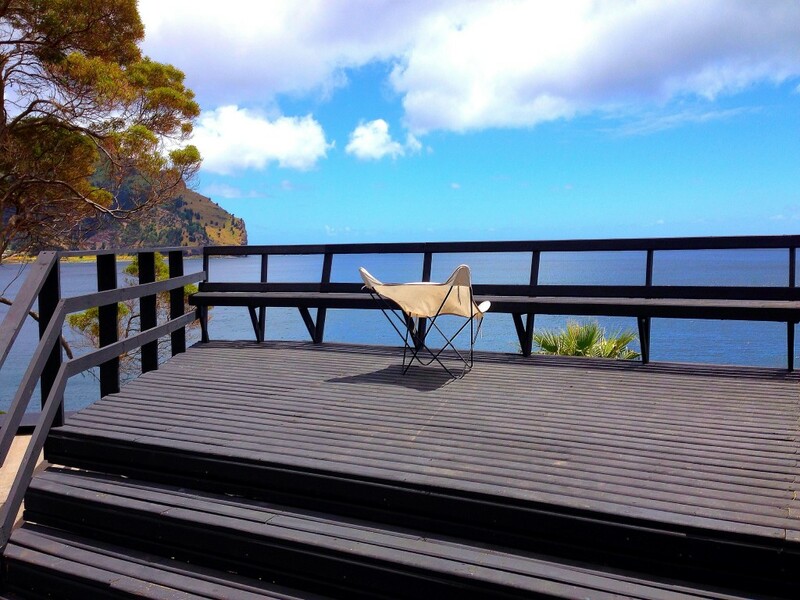 My wife and I have booked the Crusoe Island Lodge for next Jan 2015from Tues to Fri.I have contacted both airlines by email and I can’t seem to convince them to make me a reservation for those dates.They both say to get back to book in Jan.Makes no sense. I understand if the weather is bad or they don’t fill up, they won’t fly. If I wait til Jan to boo. I may not have a seat.Plus I can’t get my hotel money back by then. Any thoughts? Hi Roy. What ended up happening? Did you go on the trip? I just happened to see an article about Robinson Crusoe on Facebook and now I’m getting the urge to go…how was it? How did you end up booking? Did you end up diving there? Looking to plan a trip. Any suggestions? Lee, how long was the flight? How much did they charge?